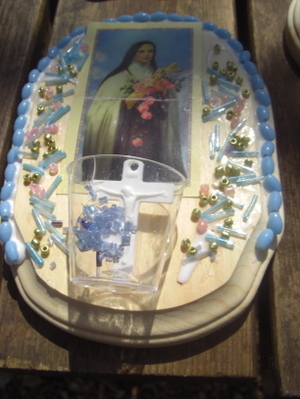 With Our Lady's month of May just around the corner, this seemed a perfect time to revisit a project that has been a hit with our local group for almost ten years: holy water fonts. We have made them many different ways, but this method was the first and favorite. 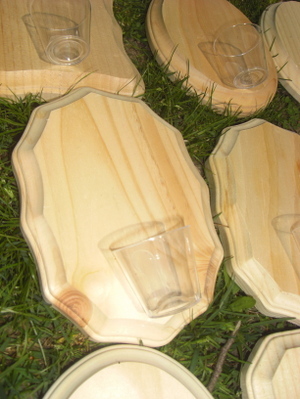 Plain wooden plaques from the craft store in a variety of appealing shapes, sturdy plastic shot glasses from the party store, beads, snow white crucifixes, and holy cards make up these simple crafts, perfect for a crowd of all ages. Paints would add a great deal to the look of the project, but I decided to spare the children's clothes in an effort to maintain my friendship with the local moms. Thanks to this beautiful group of crafters (not to mention another table full) . . . The best projects for a crowd are the ones that all look unique in the end! Another way to use these would be by putting fresh flowers in the cups with a bit of water. An afternoon of crafting works up a thirst, as you can see. Maureen's "crocs" come in handy as she goes full toe to reach the water fountain. I love this idea! 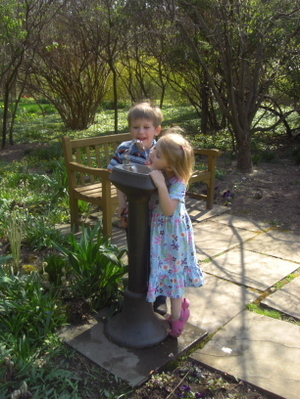 The holy water fonts are all one of a kind and fun! I think this would be great for a child to make and put in their bedroom by the door so everytime they enter or leave their bedroom they could bless themselves. God bless! I think we'll do this next week! 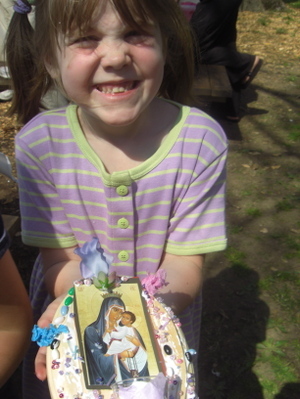 What a super cute craft!! You always have the best ideas!! Thank you so much for sharing! God Bless! Lovely! I'm linking this one from First Heralds :). Once again, thank you for being such a great resource for us Catholic homeschooling families! I always get a wonderful idea--that I know is only for good purpose--whenever I check on your site. You're a blessing to a greater community than just your own cottage! Oh, I love all these comments, but this one has me laughing my head off!!!!! Wiping away tears of laughter! BTW girls, I have twenty shotglasses left over from this craft if anyone is interested in an impromptu party at the cottage! If I'm going to have a shot of anything it may as well be Holy water! Ahhhh, a visit to the Cottage is so sobering, indeed! Beautiful! What a perfect idea for the children's bedrooms. This is such a wonderful idea! I've been searching for the "perfect" holy water font for the kitchen. Now we can actually just make one and we could even change things out to suit the season. You are just too crafty Alice! I love these! What a great idea. I love that the kids get involved. What a beautiful idea!! I'm not one do take on crafts that often, unless they are simply adorable AND needed. Or else we end up with lots of clutter type crafts. We're making these next week!! Thanks for posting! Alice as always, genius abounds :))) Thank you for sharing these just in time for Our Lady's Month!! You are a godsend! 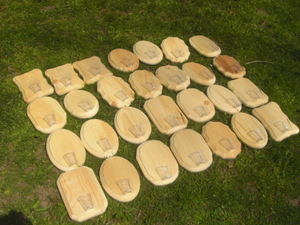 can't wait to make them with our coop! I think it is so great that these kids are doing this, and seem to love it too! 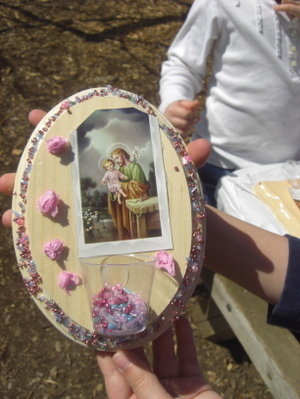 I especially love the St. Therese & St. Joseph creations..really beautiful, and a very cool kid arts n crafts creation..what a great idea..wish i was a kid again to make one myself! This blog is like a breath of fresh air..Heaven Sent kind! They are so beautiful - you are so generous with your group. They are lucky families indeed. 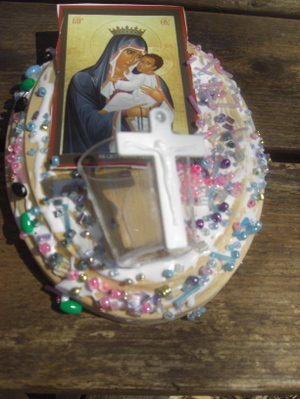 Anyway, I had thought of doing somthing like this at one time for a Lourdes craft but wondered if the cups would stick sufficiently to hold water or would it be too heavy. I don't have good luck with hot glue holding - so please share your specific techniques. Thanks. What a beautiful craft! I think I will "steal" this idea for our Little flower group next year! That all looks wonderful Alice and don't shot glasses come in handy! Alice, I loved this idea - so I borrowed it! This is what you inspired! 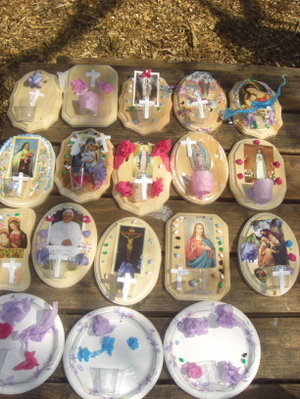 I just LOVE all your crafts using holy cards...I need to bring my aunt over to look at them, she is always finding crafty things to do for our young nieces, and she teaches CCD during the school year, so I am sure she will be inspired to do something similar with the kids! 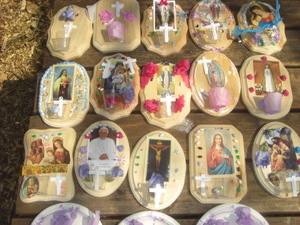 The holy water font plaques are especially beautiful. Makes me want to run to St Judes store and buy some cards ....I have plenty, but so many of mine are vintage or have sentimental value to me. Great blog, can't wait to read more! 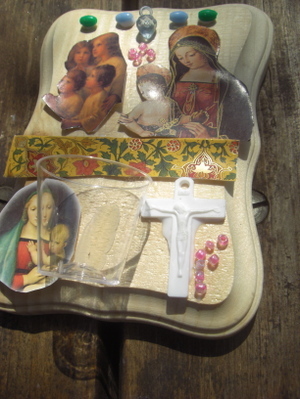 BTW....Have you seen in your online travels the wreath made out of holy cards? How did you glue things on? Just Elmers glue?